Dana Mrkich’s A Bizarre Day is an odd synchronicity to what I’ve been experiencing. No technical anomalies, but the energy I’ve been feeling the past 2 days has been unprecedented, massive light flushing in and through, cleaning me out. It’s been invigorating at the same time it’s disrupted my sleep; I feel tired and energised in the same space at the same time. Entering my inner refuge during meditation, the light is clearer there, but the space is also more crowded, as if someone organised a surprised party for me there–welcome, loving, and completely unexpected. Lucid dreaming this morning, I tried to direct the objects in the sky–only to bring down, to my disbelief, a telecommunications satellite, which headed straight for me. Lucid, I influenced its path and sidestepped it as it landed beside me. (Upon waking up I couldn’t help re-imagining the scene in an action movie, ending with me calmly lighting a cig off the smoking wreck…) In hindsight, the satellite coming down is a heck of a way to get my attention, and perfectly captures what I’ve been feeling–an influx of information too “high above me” and too overwhelming to try and absorb all at once. 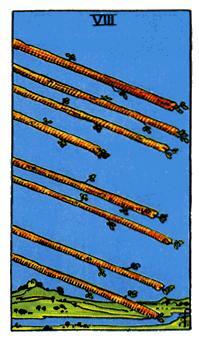 The Eight of Wands, a card I drew yesterday to get some insight into recent (personal) events, also sums it up–and shows the wands all aligned in the sky, pointing to earth (at least in the Rider-Waite design). To have that energy echoed in my lucid dream is really hitting the message home, however. The astrological outlooks I read for this week have been right on. It’s interesting to me that what they said for this week is true–either everything will be going wrong, or everything will be lining up to go right. I’m trying as hard as I can to steer it to the latter!